Pulled out more unwearable pieces from my closet. I'm loving the unlovable this week in honor of Valentine's Day! I went in search of red and pink but came out with pink and orange instead. I think these have got to be the brightest items in my closet. Of course they go together, right? I've always liked this color combination but never wore them together. 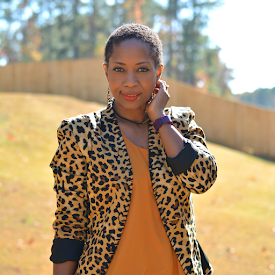 In order to hold my skirt up break up the color I added my trusty leopard skinny belt. The faux fur vest was bought at the same time I bought the chocolate brown one. I happen to like the dark brown fur better so I pass up this one up on a regular. Also, the other one has better looking fun fur. I like the shape of the inferior fun fur better better though. It doesn't overtake the entire look. Of course, that would be hard to do with the ball of color I have going on. I adore vintage gloves. I own several pairs and continue to buy them. There never seems to be a good time to pull them on. It's hard to incorporate them into the mom uniform and it's far too cold to wear them for functionality. Same thing with the Fendi bag. I need cross body or a shoulder bag for my day to day errand running. My hands and the crook of my arm are usually reserved for grocery bags and toddler what nots. I bought the DvF ankle boots to wear with jeans for a casual everyday look. They are a left baby toe killer so they've been sent to the darkest spot in my closet as I like to save the toe pain for when I spiffy up. End of day update: They aren't as painful as when I first wore them so they may just need some breaking in or my toe has finally dulled to the pain. Do you keep or toss your unwearable pieces? A thrifter after my own heart!! You look amazing in your gorgeous pink and orange-one of my favorite color combinations!! Then the way you layered it up=magic. I also love your commentary and had to laugh at your Valentine's outfit inspiration, i.e. the unlovable clothes in your closet!! Yes, they do deserve some love, don't they. Have a wonderful day! You've just made mine and I'm so happy to meet you. I'll be back. I love the pink and orange and how you broke it up with the animal print belt! I hate getting a cute pair of shoes and they end up being uncomfortable! I hope the booties get more comfortable after a few wears. I am so glad I found your blog as I look forward to your posts! This is a great style mix so very chic...love it! I keep my unwearables in the back of my dressing room & then I go back to them months later with a new vision! I actually love pairing red/pink and orange together. It is always a vibrant look and this is no exception. You look fabulous! My fave combo too. Why don't I wear it more? You look really chic with the gloves too. I love the peek-a-boo of the cheetah belt. Have fun and enjoy! Fun colors! Love Pink and orange together. I love these colors so much they are my wedding colors so I'm biased!!! LOVE!!!!!! This color combination is truly hot. I'm going to have to bite. I really like this color combination!!! This color combination is everything! I'm really liking this series. I am definitely going to have to try the orange and purple color combination! Loving it all. Who's the necklace by? It's super cute! Really love the pink and orange! Definitely an unexpected color combo -- looks great! Love the colors together! They totally work. I would have never thought to pair those two colors together. They look great and you wear them well!! you are quite the mixologist and pair colors so well! love this outfit and who can resist the gloves? !...need a pair! 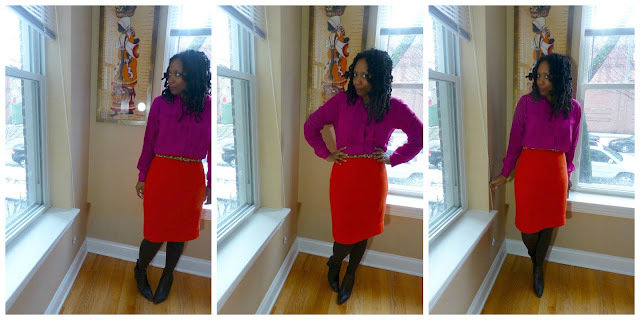 Love the colorblocking and this whole outfit in general! Happy Valentine's Day! It depends how inwearable they are. Mos of the time I end up or using them in a shoot or giving it to thrift local stores. Love your red and pink combo. This has always been one of my fave color combos...It's so bright and cheerful!